It has been recently reported that the climate in Monteverde, Tilarán Mountain Range, Costa Rica, is changing rapidly, and that these changes have begun to affect wildlife populations in the region. Anecdotal evidence suggests that the distributions and abundances of hummingbird species are shifting. It is possible that these changes are related to climate. This paper investigates this potential link, examining how climate affects hummingbirds directly and how it affects their resources, namely nectar producing plants. Hummingbirds have complex effects on the plant community through pollination. In turn, nectar and flower production affects hummingbird behavior, population size, and life cycle. Climatic variables including precipitation, temperature, and cloud cover all affect nectar production. Research shows that precipitation also impacts hummingbirds directly. 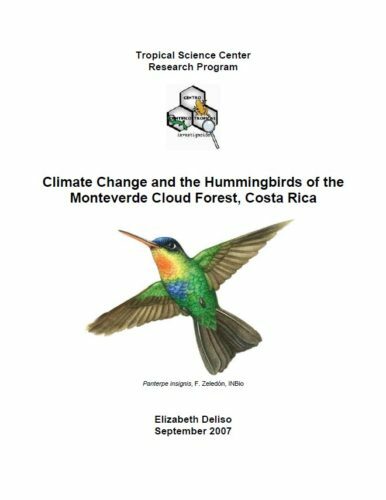 In Monteverde where the climatic trend is one of decreased precipitation, increased temperature, and increased cloud cover, the potential effects on hummingbird populations and the plants that support them are complex. It is possible that there will be a shift in the spatial and temporal distributions of both hummingbirds and plants and a change in the relative abundances of species. A decline in nectar resources resulting in a reduction of hummingbird diversity is possible. Because of the complexity of the potential effects, it is crucial to implement a monitoring program and conduct experiments to deepen our understanding of the relationship between climate change and wildlife biology. Chapter 2 describes a plan for undertaking this research at the Monteverde Cloud Forest Preserve. This includes determining the population sizes and relative abundances of hummingbirds in the region, identifying important flowering plant species, delineating their phenologies, and noting hummingbird visitation rates to these plants. Techniques for measuring nectar are described. Experiments to ascertain the effects of precipitation, temperature, and cloud cover on nectar production are outlined. Baseline data from earlier studies in the region can be compared to new data in order to determine the extent to which climate change has already begun to impact the hummingbirds of Monteverde. Chapter 3 discusses the pros and cons of using hummingbird feeders as a research tool, and recommends that feeders only be used in a limited capacity and in areas of high flower abundance. The ultimate goal of this paper is to facilitate the conservation of biodiversity in an ever-changing Monteverde.